Unequal Funding For PhDs Leads To "Unequal Education"
How will you afford your Social Science Ph.D? The Chronicle of Higher Education reports that unequal funding for PhD students across disciplines is leading to an “unequal education,” where students in relatively flush disciplines (such as business and the STEM fields) enjoy more comfortable stipends, while those in the humanities and social sciences are left scrambling to find jobs off campus or take out loans to supplement their much smaller paychecks. The Chronicle’s story focuses on grad students at the University of Houston—a PhD student in Business whose stipend of $33,000/yr puts her among the most generously-funded grad students, as well as students in the humanities and social sciences whose stipends started at a far more modest $11,000-$13,000 (even after recent, hard-won funding increases, funding in those departments is well under $20,000/yr). There are many factors that contribute to this disparity, including the availability of research grants in the field, the competitive profile of the department, and the university’s investment in developing its reputation in the discipline (as well as what it is willing to do to recruit top students in the field). As the Chronicle story makes clear, low stipends have multiple effects: students might be forced to take out loans to fund their degree, when they likely already carry debt from their undergrad education and the academic job market is ever more insecure. Or they might search for off-campus employment (often in violation of the terms of their PhD funding packages), which can slow their progress to their degrees and take time away from the work they need to do to be successful academically (publishing, university service, etc). Not only do students in the Humanities and Social Sciences take on more debt—more of them take on debt. The NSF survey for the same year found that while more than ¾ of engineers graduated without debt, over half of humanities PhDs had student loans. There are other disparities, too: a study has found that Black and Latino PhDs, even in STEM fields, graduate with substantially more debt than their white counterparts. What is there to be done about disparities in funding? Would higher stipends improve the PhD experience? What does all this mean for you, if you’re considering a PhD? First off, a few schools have been considering ways of increasing their funding packages for students in the humanities and social sciences. Some have suggested funding fewer students at a higher level, or funding students at a higher level for fewer years. Second, what should you be aware of as an applicant? I advise you to look into your funding options carefully—including outside and summer fellowships. Find out how many years the programs you’re targeting will guarantee funding for. Is summer funding available? What about travel funds for research or conferences? What is the cost of living? 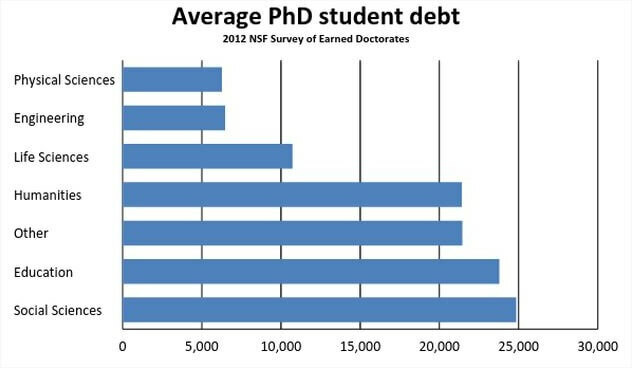 Finally: would you be willing to go into debt to earn a PhD? For me, the answer to that question was “no.” I was fortunate to have funding throughout grad school—but you don’t need me to tell you that living in Los Angeles on $15K a year required some careful budgeting! The experience also made me acutely aware of the benefits of applying for outside funding, which helped me finish debt free.